We made it! The three leaders, that is. We spent the day – which happens to be Carolyn’s birthday – visiting each site of the first half of the days of the travel course by car. The weather was perfect – sunny, temperatures around 22C, and just the slightest of breezes. The towns each have their own character, many with lovely cobblestone streets (called kinder cops, or “children’s heads”! ), which are narrow in places and have long chains of row houses that are occasionally separated by a church or a tower (making it all very picturesque). And, of course, no matter where you look, there are people on bikes, bikes in racks, and bikes paths – an endless criss-cross pattern of bike paths. And there is water – in canals, rivers, lakes, and the sea. These two things are key to why we are here in the Netherlands, and we eagerly anticipate the many visits we will make to learn how the Dutch manage water for so many purposes – from agriculture to domestic to wastewater recycling to living life at, nearly at, or even below sea level. We ended the day here in Dordrecht at a hostel near the Biesbosch National Park, a lovely natural area protected for people to both enjoy nature, but also for water management purposes. I learned an important lesson – thou shalt not plug in a power strip with a Dutch 2 prong adapter to the wall – or else face blowing the power in your room, and in parts of several others’ rooms too. Unfortunately, no amount of flipping of fuse boxes by the hostel staff would do the trick to get the power to return. 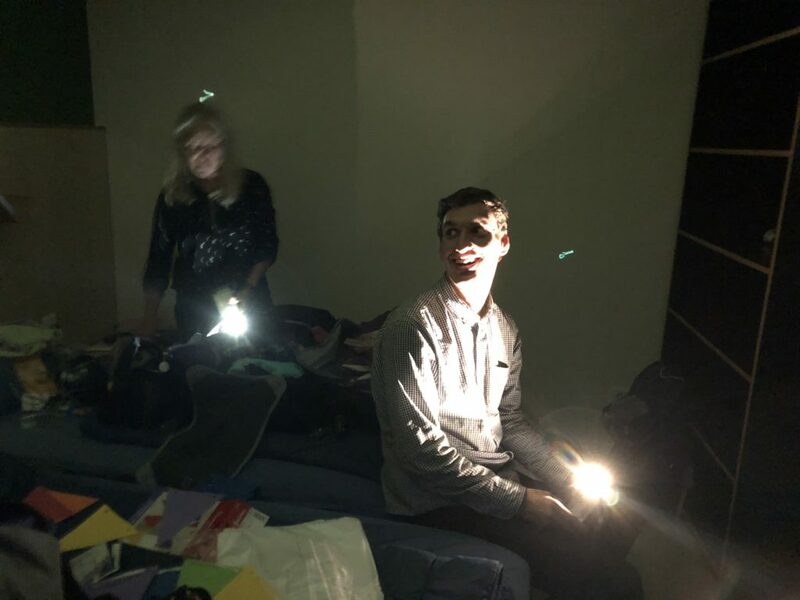 Luckily, we have no need for much light as it is time to rest – it is already past 10 PM, and we have, for all intents and purposes, been up for 36 hours, having taken only cat naps on the plane. 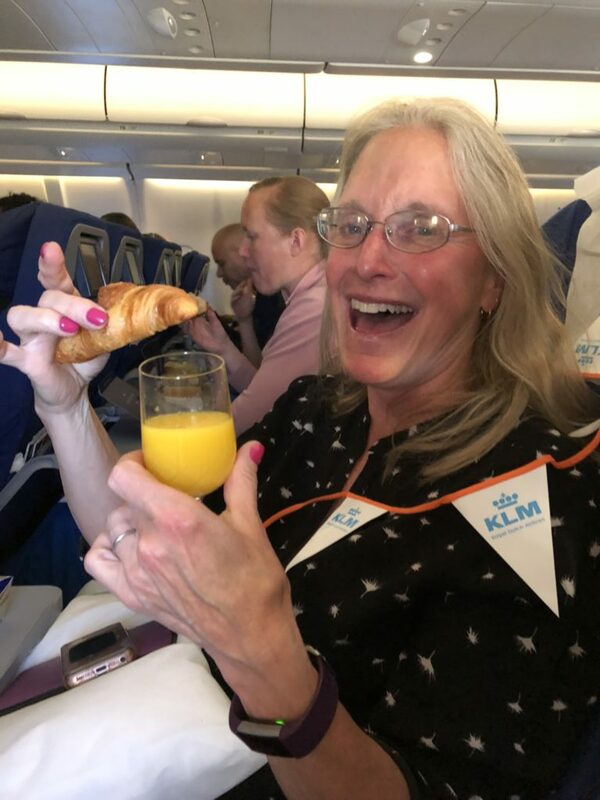 Carolyn’s birthday was sweetly recognized by the KLM staff on our flight with a serenade of “Happy Birthday to You,” hot croissants, a personally signed birthday card, traditional Dutch paper chain, and a celebratory OJ just after midnight Eastern Time as they served breakfast (it was nearly 6 AM local time).